I think that Hume’s two most famous arguments are his argument against induction and his argument against belief in miracles. I also think that if Hume embraced either one of these arguments, he ought to have rejected the other. 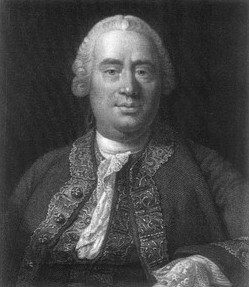 Hume’s brief argument against induction is found in his Treatise on Human Nature, Book 1, Part 3, Section 6. Without reproducing Hume’s comments in full, in a nutshell the claim is this: We can only ever observe a finite number of things. There is nothing about examples of things that we have observed that justifies making generalisations about all events of that sort. “From the mere repetition of any past impression, even to infinity, there never will arise any new original idea, such as that of a necessary connexion; and the number of impressions has in this case no more effect than if we confin’d ourselves to one only.” In short, we cannot reason from a finite number of examples that we observe to a general rule that applies to all examples of that sort. Don’t base your criticism of the argument (if you have one) on my necessarily brief summary. Before commenting on Hume’s argument, read Book 1, Part 3, Section 6 in full here. Failing that, just accept my very brief summary. Now, what was Hume’s argument against belief in miracles? His position was that we cannot have a justified belief that miracles have ever occurred. Why is this? Hume’s argument against (belief in) miracles is found in section 10 of his Enquiry Concerning Human Understanding. Suppose, for instance, that the fact, which the testimony endeavours to establish, partakes of the extraordinary and the marvellous; in that case, the evidence, resulting from the testimony, admits of a diminution, greater or less, in proportion as the fact is more or less unusual. The reason why we place any credit in witnesses and historians, is not derived from any connexion, which we perceive a priori, between testimony and reality, but because we are accustomed to find a conformity between them. But when the fact attested is such a one as has seldom fallen under our observation, here is a contest of two opposite experiences; of which the one destroys the other, as far as its force goes. There must, therefore, be a uniform experience against every miraculous event, otherwise the event would not merit that appellation. And as a uniform experience amounts to a proof, there is here a direct and full proof, from the nature of the fact, against the existence of any miracle; nor can such a proof be destroyed, or the miracle rendered credible, but by an opposite proof, which is superior. Maybe you think this is a good reason to say that no miracle has ever happened, and maybe you don’t. But here’s my second question: What type of argument is this? The answer is that it is an inductive argument. What did Hume say about inductive reasoning? Posted on September 30, 2009 January 3, 2019 by GlennPosted in epistemology, philosophyTagged David Hume, induction, miracles. Although I sympathize with Hume’s preference for naturalistic explanations, this argument always did seem suspicious. Particularly, the definition of a miracle as “a transgression of a law of nature by a particular volition of the deity, or by the interposition of some invisible agent”. It’s not obvious at all that a miracle would have to violate the laws of nature. This argument is certainly not an argument “against miracles”, as it is often called (not here). Hume surely does not believe that even the very occurrence of miracles is impossible. It has also been argued that he wasn’t, in fact, an inductive sceptic. Couldn’t it also be the case that the received wisdom about Hume is a bit exaggerated, as well? I agree when it comes to the definition of a miracle – but I don’t think Hume’s to blame here, as plenty of Christians defined (and still define) it that way as well. As for whether or not Hume really was an inductive sceptic, well I confess to not being a Hume expert so all I really have to work with is the prima facie intent of his argument on induction. I think you’re right that these arguments undermine each other, but I think Hume can be made consistent on one point. He does say the argument against miracles is based on custom, and he discusses custom at great length in his treatment of induction. We don’t know of any such thing as causes or laws behind the constant conjunction. Custom leads us to infer such laws and causes. But he doesn’t think of custom as being in the same epistemic category as fortune-telling. He thinks of it in the same epistemic category as our inclination to trust our senses. In neither case do we have knowledge, but in both cases it’s seemed so far to have been beneficial to trust our senses in everyday life and to infer causes and laws in science. So this same useful faculty then leads to the experiences that lead us not to believe in miracles. To be consistent, he wouldn’t say we don’t know there are no miracles. He’d just say the kind of experience that it’s been pragmatically good to rely on should lead us to discount claims of them. So he actually is more consistent than he seems. But here’s the kicker, or at least he could be. But he can’t conclude that we have good epistemic grounds to disbelieve in miracles. At best it’s the faculty that helps us to have beliefs of pragmatic value that also might lead us to discount reports of miracles. But he hasn’t argued in this case (as he does in the sensory case and the scientific laws case) that we have pragmatic value to accepting the dictates of the faculty he calls custom, and he insists that this faculty is of no epistemic value. So that does seriously undermine the attack on miracles. “To be consistent, he wouldn’t say we don’t know there are no miracles” – Hume really didn’t help himself here, because he actually went futher and called the experience uniform. He even claimed to have offered a proof against miracles, which pushes his claim beyond even induction. If he had stuck to a weaker claim appealing to custom and had reduced his conclusion from proof to something along the lines of “hesitance,” his argument simply wouldn’t have had the rhetorical power that it has as Hume penned it. Obviously my critique is incredibly brief and only sketches how a fuller argument might be constructed. I think the best published work on Hume’s argument is John Earman’s Hume’s Abject Failure. He tackles the issue of what should be taken into account when assessing the inductive probability of miracle claims. I basically agree, but you complicate things too much by making over-strong claims. I think it’s sufficient to point out that the logical link ‘And as a uniform experience amounts to a proof,’ directly contradicts Hume on induction, where a uniform experience not only does not amount to a proof, it doesn’t even make an extension of the uniformity PLAUSIBLE. Martin, I’m impressed that I’m still getting comments on posts that are nearly a decade old!